Are you shopping for new carpet flooring to replace the worn, damaged, or outdated floors in your home or business? If your carpets are lumpy, stained, or stretched, it’s time to replace them entirely. Shop at our carpet store for a comprehensive selection of new carpets that will transform your home from dated to stunning. Whether you want a style that is bright and bold, or more simple and earthy, you can rely on our team of flooring experts to help you choose the home carpet that suits your style as well as your budget. When you stop by with us, our friendly flooring specialists provide you with excellent customer service. You’ll enjoy a stress-free shopping experience from start to finish. If you’ve been considering purchasing new carpet flooring, now is a perfect time. You deserve to have the stylish flooring you want, and we have the high-quality, low-cost carpets you need. With so many options in our showroom, you are sure to find the perfect fit for your style and budget. Our sales crew is trained on every type of floor that we sell so we can best assist our valued customers. From Berber carpet to Frieze carpet, we will explain the benefits of each of the diverse styles in our shop and help you select something that performs optimally in your household. We understand that your time is important, and we’ll always try to provide you with a carpet recommendation in a timely and efficient manner. 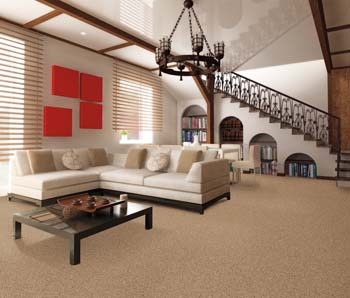 There are many advantages to working with our specialists for your carpet needs. We have the knowledge and expertise necessary to determine what kind of carpet is right for your particular situation and stylistic desires. Every client is different, and our specialists always take a custom-tailored approach to find the best carpet for our customers. Depend on us for attention to detail and superb customer care. Prior to shopping for a new carpet, it’s important to know when it’s necessary to replace your existing one. There are a few signs that indicate it’s time to upgrade your home’s carpets. One sure sign your carpet needs to be replaced is extensive staining throughout the carpeted areas in your home. Carpet cleaning may work in some cases, but it’s only a temporary solution. The best way to ensure that your home’s carpets are free of tough stains is with new carpet installation. Even thoroughly cleaned stains may leave behind particles that build up over time. This can lead to mold and mildew under your carpet, which is a serious health hazard. Another reason to consider replacing your carpet is extensive wear and tear. Our floors see a lot of use over the years as we walk across them on a daily basis. If you’re dealing with matted, torn, or otherwise worn-out carpeting, it may be a safety issue you want to consider. Our designers can help you find a carpet that matches your existing décor, or a new style so you can begin to transform’s your home’s appearance. Our showroom is filled with every color and style of carpet imaginable. From neutral shades of ivory and cream to vibrant favorites such as plum, pink, and green, we have it all. Are you shopping for a specific style of carpeting? We sell Saxony, Frieze, Texture, Velvet, and Berber carpet, as well as an array of patterned styles. Do you want to see how your favorite carpets will look in your house before you make a commitment? Our company has complimentary carpeting samples available to bring home so that you can be sure it will look great with your interior design scheme. If you’re ready to begin this exciting home improvement project, get in touch with us at 619-456-0616 to learn more about our amazing carpet selection. Rely on our trained and skilled installers for the quality install you expect and deserve. Choose the crew that uses the proper tools and equipment to ensure there are no bubbles, tears, or other problems that can arise in the future. We provide carpet installation for projects of all sizes. Our star-rated products also come with a Lifetime Installation Guarantee. Our Ultimate Confidence Guarantee helps you to protect your investment in star-rated flooring by promising to replace any flooring you are dissatisfied with. If you contact us within 30 days we will replace this variety of flooring with a comparable product at no charge to you. Ask one of our design specialists if this guarantee is included in the flooring option you choose. Discover the endless possibilities that can become realities with new flooring from our store today. New carpet adds value to your property. Prospective homebuyers place a major emphasis on the quality of the carpet or flooring in the homes they consider for purchase. If you’re considering selling your home at some point, having your damaged carpet replaced is a great investment. Not only should stained or damaged carpets be replaced, but you should also consider replacing stylistically outdated ones as well. Interior designs standards have changed with the passing years and styles such as 1970s shag carpets are not as acceptable to modern homebuyers. Bring your carpets into the 21st century with the purchase of a stylish new carpet option from our local showroom. Contact us when you need a new carpet. We serve our customers in Santee, La Mesa, El Cajon, Alpine, and San Diego, California.